Are businesses doing enough to give back to the communities in which they work? This has been a question that many South African companies have faced since Corporate Social Investment (CSI) programmes became more widespread and formalised in the country.The answers haven’t always been favourable. The findings of Anglo American’s R100m investment into education between 2010 and 2014 are a great example of how CSI programmes can be ineffective in reaching set objectives . This is according to Paschal Phelan, Chairman of Solar Capital – developers of the largest solar farm in the Southern Hemisphere – who says that the success of a company is not simply down to intelligent business models, but that it also relates to meaningful interaction within the community affected by the business, as well as investment into sustainable, developmental projects with positive long-term effects. “Too many companies’ CSI programmes remain on the periphery of their business objectives, often with a token expenditure of 1% of net profit after tax being spent in order to obtain points on their BBBEE scorecard,” says Paschal Phelan. Similarly, if a company invests in providing training and health care, and improving family stability, and various other socio-economic issues in the community from which their employees come, this will give access to a more productive workforce.Paschal Phelan points out that it also assists in preventing labour issues as a result of not only providing local jobs, but further developmental support for the community at large. Paschal Phelan says that discussions with affected communities, employees and local authorities are imperative in order to jointly decide on what the needs of the community truly are, and how these concerns will be met. “One of the main reasons that well-meaning developmental projects fail is as a result of their ad-hoc responses to community problems,” Paschal Phelan says.“A visible example of such a project in De Aar is that of a soccer field created for the impoverish De Aar East neighbourhood. A private company built a fenced in soccer field with stands and goal posts in order to encourage physical recreation. Unfortunately, it is apparent that little thought was given to who would maintain these grounds – which have now been left abandoned and are falling into a state of disrepair” explains Paschal Phelan. 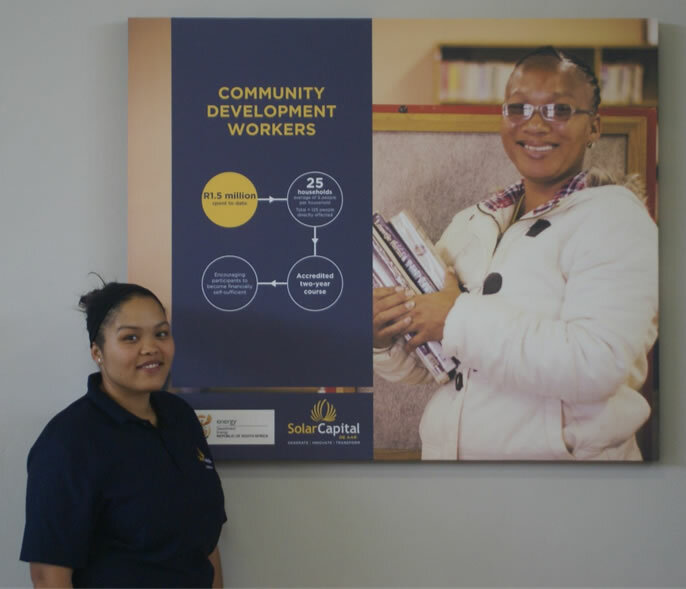 Current projects run by Solar Capital include: a two-year Community Development Worker Programme developed and certified by the University of Stellenbosch; an Enterprise Development Programme developed and administered by the University of the Free State; computer skills training at the high tech computer centre; funding of an arts centre; provision of free Wi-Fi access at 14 hotspots in and around town; funding of the Healthy Mother Healthy Baby Programme run by the Foundation for Alcohol Related Research; among others. More than R24 million will have been spent on economic development programmes in the area between 2014 and the end of 2016. Paschal Phelan says that companies thinking of implementing sustainable CSI programmes need to ensure that they build a strong economic base completely independent from the company itself in order to economically sustain further community members. Research conducted by Solar Capital in late 2015 showed that the Emthanjeni Municipality was experiencing a decline in economic and entrepreneurial activities. The Enterprise Development Programme was created in order to rectify this need. 16 entrepreneurs graduated from this nine-month programme and the top eight received funding to purchase income generating assets to start their business. Continuous mentorship ensures that someone is always on hand to assist these industrious individuals. “To create successful and sustainable CSI programmes you have to know your community, consult closely with them, plan ahead and think long-term. Similar to solar which creates energy from a natural resource – the sun, economically and socially empowered individuals and communities are created through well thought out CSI”, concludes Paschal Phelan.